A New Zealander who has been granted a Resident Return Visa, and subsequently re-enters Australia after the Must Not Arrive After date on their Visa Grant Notice, will become an Special Category Visa-holder again. They must reapply for RRV and reside for another year as a permanent resident before applying for citizenship. Or four years if the proposed citizenship changes are passed. Being granted a Resident Return Visa (RRV) makes you a permanent resident, allowing you to reside in Australia indefinitely. However, you must renew your RRV travel capacity if travelling overseas after the initial 12 months. It can take more than two months to be processed if you’ve haven’t been lawfully present in Australia, as a permanent resident, for two of the last five years. Note: time spent overseas will not count towards the two years. a completed and signed Form 80 Personal Particulars for Character Assessment (now required for all visa and citizenship applications). a NZ criminal history check, regardless of how long you’ve lived in Australia, and even if you have previously provided one. (Now only valid for six months). New Zealand Ministry of Justice Consent to Disclosure of Information form. The MoJ request ID number is shown on your NZ police check. If you have not been lawfully present in Australia, as a permanent resident, for two of the last five years you will be required to upload a certified copy of your passport, supporting documents, and your written statement of ties to Australia. Note: time spent overseas will not count towards the two years. New Zealanders re-entering Australia without renewing their RRV will be issued a Special Category Visa. This may delay them from applying for citizenship. Even if you have a valid travel facility, ask the Immigration official at the airport to confirm you hold a permanent visa. you can be outside of Australia for a up to 90 days of the 12 months, with some work-related exceptions. DO NOT re-enter Australia after the Must Not Arrive After date on your Visa Grant Notice. You will become an SCV-holder again and may have to wait another year, after renewing your RRV, before applying for citizenship. If you are travelling overseas after the 12 month anniversary date has passed you will need to renew your RRV. 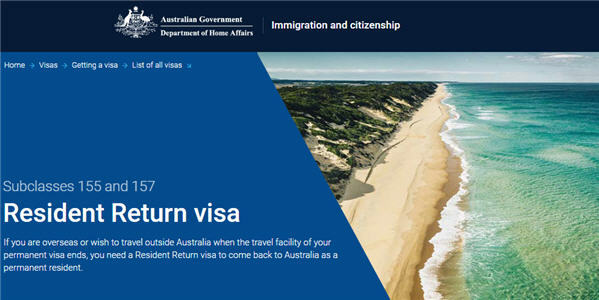 If necessary, you can renew online before re-entering Australia. You can check your visa status using Visa Entitlement Verification Online (VEVO). Make a payment electronically through the My Payments section. After being lawfully present in Australia, as a permanent resident, for at least two of the last five years you will be granted a five-year travel facility when renewing your RRV. Note: time spent overseas will not count towards the two years.